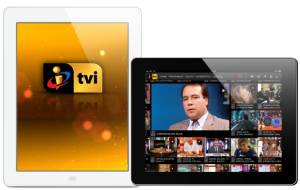 The TVI application for iPad is ranked among the best Portuguese apps in the Apple’s Top. The TVI app, launched in February this year, occupies the seventh position in the absolute Apple ranking. On top iPhone apps, TVI shows a very good position, in 15th place. On TVI app you can see, among other things, the games of the Champions League, Secret Story and live stream videos. Besides TVI app (also available for Android and Windows Phone), Media Capital Digital has also launched apps for TVI24, Mais Futebol and Marcelo Rebelo de Sousa, all of them available in the app store.